This new composite image shows the sun's activity in X-rays and ultraviolet rays. 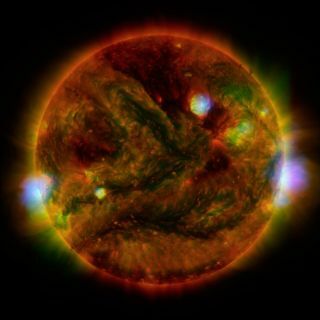 A new image of the sun shows a cornucopia of X-ray and ultraviolet colors erupting from our nearest star. Our sun is in an active period with plenty of sunspots and flares, as it leaves the peak of a cycle that takes place every 11 years. "We can see a few active regions on the sun in this view," Iain Hannah, an astrophysicist at the University of Glasgow presenting the research, said in a statement. "Our sun is quietening down in its activity cycle, but still has a couple of years before it reaches a minimum." For reasons that are still being uncovered, the sun generally goes through an 11-year cycle of activity. During the peak of the cycle (which took place last year), flares from tangled magnetic-field lines on the sun can strike Earth's upper atmosphere. This can cause frequent auroras and occasional satellite or power disruptions on Earth. By studying the sun, scientists hope to better understand the secrets of the solar cycle and make better predictions about when the next flare will occur, improving our ability to protect satellites and power infrastructure from disruptions. While NuSTAR is commonly used to look at black holes, the satellite also can be used as a tool for solar observations. It's too sensitive for big flares, but it can see microflares (flares that are only one-millionth the energy of the biggest eruptions). NuSTAR could also find a hypothesized type of flare called a nanoflare, believed to be only one-billionth the energy of a typical eruption. If found, nanoflares could better explain why the sun's atmosphere (corona) is hotter than calculations predict. Nanoflares would be hard to see due to their diminutive size and also because the sun is so active right now. However, Hannah said that, as the sun quiets down, NuSTAR's ability to pick out high-energy X-rays could help scientists track them down. NuSTAR could be used to find exactly where eruptions occur, and also to find a hypothetical dark-matter particle called the axion. Dark matter is a mysterious substance that is undetectable by conventional instruments except for its effect on other objects — such as how it bends light. The image was unveiled Wednesday (July 8) at the National Astronomy Meeting in Llandudno, United Kingdom.